I haven’t made risotto in a long while. 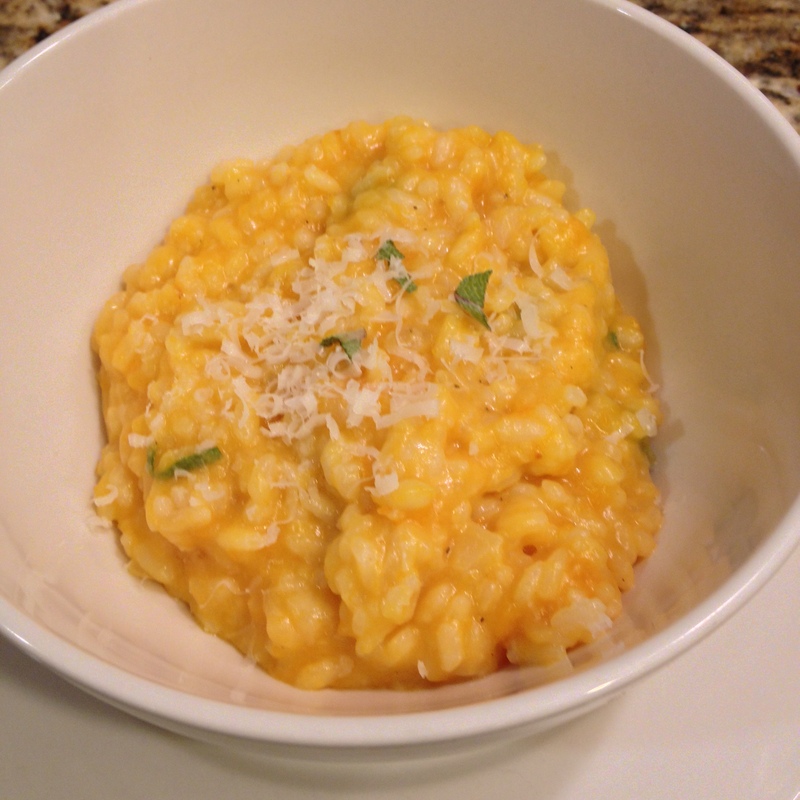 I had some leftover roasted butternut squash and I got it in my head to make risotto with it. Of course dinner was running late and I was worried my kids wouldn’t eat this “new and foreign” food. So I made them a quick alternative meal and prepared this for Lou and I.
I had forgotten 1) how easy risotto is to make and 2) that it is delicious and deceptively creamy. I love creamy and my typical rich and creamy foods get that way with the addition of cream and/or butter. Not so with risotto. It gets creamy by adding liquid, cooking and stirring. I takes about 20 minutes to make risotto and you should stir a lot of that time. But take mini stirring breaks to load your dishwasher, make a salad and feed your kids. 1. Melt butter in a medium-size saucepot over low heat. Add onion and cook, stirring, until translucent but not browned. 2. Turn heat up to medium. Add rice and stir until it looks almost translucent with a white dot in the center of each grain. Add wine and cook and stir until absorbed. While stirring, preheat chicken stock in a microwavable measuring cup or bowl. 3. Add stock 1 cup at a time, stirring until stock is absorbed. After 3 cups, add 1/4 cup at a time, stirring and testing. Take a taste: you want tender but slightly firm to the bite. When risotto is the right consistency, stop adding stock. Mix in your butternut squash. 4. Finally, fold in parmesan cheese and half the sage. Spoon into bowls and garnish with remaining sage and a sprinkling of parmesan. Serve and enjoy with the salad you made in between stirs.